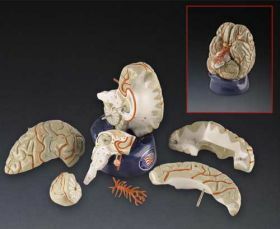 Life size model of the brain incorporates the arterial blood supply complete with termini of the internal carotids, basilar artery, and Circle of Willis. 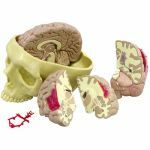 Cranial nerves and a dissectible brain stem are featured as well. 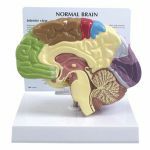 Right hemisphere divides in two parts, left splits into 4 parts including half of the brain stem and cerebellum. Pituitary and basilar artery may be detached. Rests on a molded base. 115 numbered features with key card. Model size: 6" x 5" x 7"